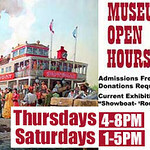 The Waterfront Museum, sometimes called the Circus Barge by locals, is a museum on an old showboat, meant to entertain and educate visitors about the historical aspects of Red Hook Harbor and Waterway. Schools make annual visits and you can be sure that the Waterfront Museum is great destination for the entire family. The museum's mission is to "provide waterfront access, and promote historic preservation. We foster an understanding of the NY Harbor as a waterway carrying commerce and commuters as well as a means for culture and recreation." And, on Sundays in June they have circus performances on board.